Reaching record number of calls and faults and all in addition to excessive amount of work and controversy. 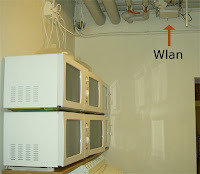 A number of AccessEzy sites are supplied by RedMedia DSL connections, the typical 1.5Mbit style ones. These have been up and down over the past two days for more than 12hrs at a time thanks to a extremely poor planned and executed changeover of hosting facilities by RedMedia. So you can think of 31 sites down with multiple customers per site all raging at us. Now the current management wish to ditch us outright in exchange for a new wireless carrier that has recently grown a presence in the area. They seem to think all the infrastructure belongs to the body corporate when in fact it was installed and paid for by us... I'm leaving it to the legals before flexing my technical powers to reduce them to nothing. On a positive note I have been dealing with the Curtin University in organising the take over of their Student Accommodation Internet services. Everything seems good - they already have a top quality infrastructure in place (Cisco 2950 and 3550 series switches), 100Mbit to each room and its all managed by the Uni. I simply have to install an access controller and they do the rest. Of course I need to organise the backhaul internet feed and backend management software/hardware, but this is looking a lot more easier than micro-managing the site itself.